La Rosa: The planting day became a vibrant community event. We have learned through our experience as landscape architects that infrastructure development or upgrade projects can be about much more than environmental design. Projects have developed and created recreation opportunities. Three such projects we have been involved with are the Watercare Services, Mangere Watercare Coastal Walkway; La Rosa Reserve in Auckland’s Green Bay; and Te Auaunga Awa, Oakley Creek through Walmsley and Underwood Parks. These last two projects are in Auckland Council parks and are primarily stormwater management projects. As designers we are concerned by whether the community will ultimately benefit from our design decisions, not just the asset owner who commissioned the project, as the community is the ultimate client. These projects captured the imagination of the community, which we consider a successful design outcome. All of these projects add an interconnectedness both within local communities and within cities; in this case Auckland. Infrastructure – be it stormwater, wastewater, transport or electricity transmission – is generally linear. When it is redeveloped it becomes an area of community focus and part of an open space network which links not only communities, but ecological corridors that are pathways for invertebrates and birds. The first project, the Watercare Coastal Walkway, was initially developed when the Mangere Wastewater Treatment Plant was upgraded. The project began in the mid-1990s and the upgraded Mangere Wastewater Treatment Plant opened in 2004. The project included the removal of some 500 hectares of oxidation ponds and the construction of white shell beaches and bird roost areas. Boffa Miskell worked with Watercare and local community groups to design the open space components of the project. This included over 300,000 plants being planted and more than 12 kilometres of pathway, boardwalk and viewing points, including a bird hide being developed. Since the initial project, Watercare has continued to develop additional connections and areas. Most recently a decommissioned pump station at the eastern end of the Puketutu causeway has been transformed as a resting area on the pathway, with seating and interpretive signage. Now 15 years since the initial development, the Watercare Coastal Walkway is much used and loved by the local community and is a popular weekend outing. The plantings provide food and shelter for a diverse range of birdlife, including tens of thousands of sandpipers, godwits and other migratory birds that head every year to the Manukau Harbour to escape the northern winter. They in turn draw ornithologists from throughout the world who come to view the migratory bird phenomenon. Despite being known in this world sense, the area awaits discovery by more Aucklanders. The second project, La Rosa Reserve in West Auckland, was one of former mayor Len Brown’s “100 days projects”. Initially a stream daylighting project, we envisioned the transformation from it being piped to an open rehabilitated stream, where it would be one where the community could interact with water and the wildlife would return. The community came into the project late, but seized the opportunity: planting days were community events, schools participated with installing art, a community orchard was planted and the redeveloped kindergarten now sits behind a transparent fence, embracing its connection with the wider park. Local weavers maintain the flax collection planted through iwi consultation. The revitalised stream is flanked by boardwalks and bridges and the large rock stepping stones through the watercourse are a favourite shortcut for children. What was a wet boggy local reserve is now a vibrant community park. 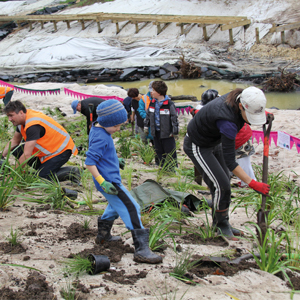 The final project, Te Auaunga Awa, is a flood management project led by the community and guided by social outcomes. The Owairaka and Wesley communities have been involved from the outset and the outcomes are far-reaching. Flood management is sought in the area around this linear park, where Oakley Creek runs through Walmsley and Underwood Parks, in which the stream was channelised during the 1920s. The park is surrounded by single lot units and in a 100-year flood event over 150 floor levels flood. Approximately half of the residential units are Housing New Zealand properties and when the flooding risk is removed an opportunity for intensification and redevelopment has been opened up. Early community involvement through school participation and open days, and workshops involving a number of groups will see a true community outcome. This will embrace the cultures of the community and encourage active play through experiencing the local environment. Walkways, playgrounds, stream revitalisation and biodiverse planting to create ecological corridors for wildlife and public art are all part of the wider recreational outcome under development. The Watercare Coastal Walkway: Watercare Services; the Mangere WTP Community Liaison Group; HEB Landscapes. La Rosa Reserve: Auckland Council, engineering design consultants; Ecomatters Trust; HEB Landscapes. Te Auaunga Awa: Auckland Council; Puketapapa Local Board; Aecom; McKoy & Heine Architects; artist, Filipe Tohi; representatives of: Te Kawerau Maki, Ngai Tai Ki Tamaki, Ngati Tamaoho, Te Akitai, Waiohua-Tamaki, Ngati Te Ata and Ngati Whatua Orakei; representatives of: Friends of Oakley Creek, Migrant Action Trust, Wesley Reconnect, Roskill Together, Earth Action Trust and Puketapapa Active Transport Haven. Sarah Collins and Larissa Moyle, both landscape architects at Boffa Miskell, will make a wider presentation on this topic at the NZRA National Conference, Queenstown 9 – 11 November.